vitamin J: Retail Therapy: What's black and white and has a wedge heel? Retail Therapy: What's black and white and has a wedge heel? I originally saw these white flared jeans (does it bother anyone else that I actually typed 'genes' first and had to correct it?) in red and wanted those, but I already had a pair of red jeans and no white ones, so I made a decision with my head. 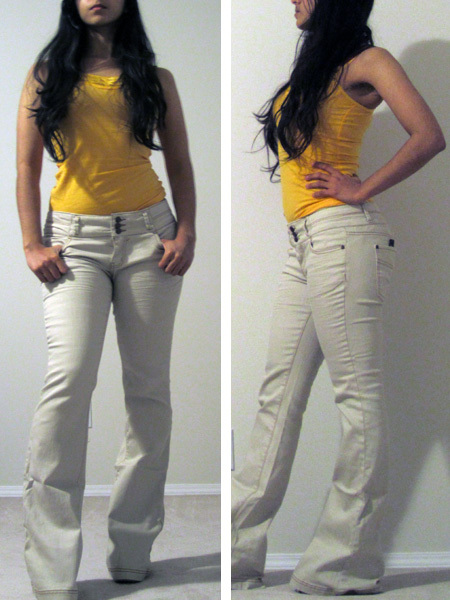 They fit well through the hip and thigh, although they are loose in the waist (story of my life). It's not too bad, but I hope they don't bag out! They're also obscenely long. I'm wearing my most giant wedges (probably 5 inches) in the picture and they still touch the floor. Definitely need to be hemmed. I can see them being perfect in the summer! I'm wearing size 27, but I'd probably go for 25 or 26 in the future (they didn't have them in stock when I ordered). So this was the one I was most worried about. I looked and looked on the F21 site for a skirt that was long enough to wear to 'work' and found one, but the model shot looks ridiculously unflattering, and I was worried the material was going to be way too thin. 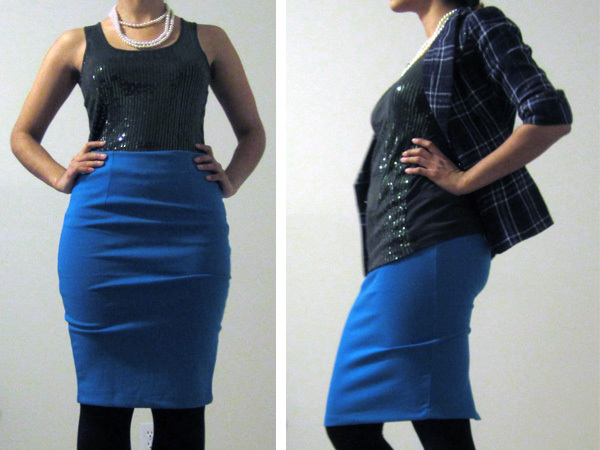 It's pretty thin, and not a pencil skirt I would recommend if you have other options. But it doesn't make you lumpy like in the product shot! I really love the colour and since it's kinda long on me (hitting at or just below the knee; for reference, I'm 5'1"), I can scrunch it up a bit to hide blouse-tucking lines and the like! Score! I forgot this had a zipper when I was trying to get it off, and was like, why could I get it on so easily and now it won't come off??? Unfortunately I tried a bit too hard and undid the stitching of a dart a bit, but it's an easy 5-minute fix, so I'm not too bothered. I was quite excited about the belts. 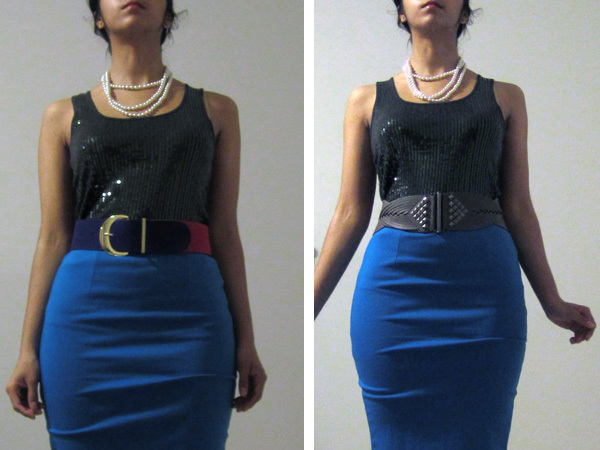 I love belts. I have too many belts. I really liked this colour-blocked one and hoped the S/M would be OK. It was! Huzzah! I don't really like how the pink segment is quite small, and the black elastic around the back is a large chunk of the belt. But the colours are very lovely and rich! I got this studded belt because I loved the weave detailing, the lighter colour (I don't have any lighter wide belts) and the studs. 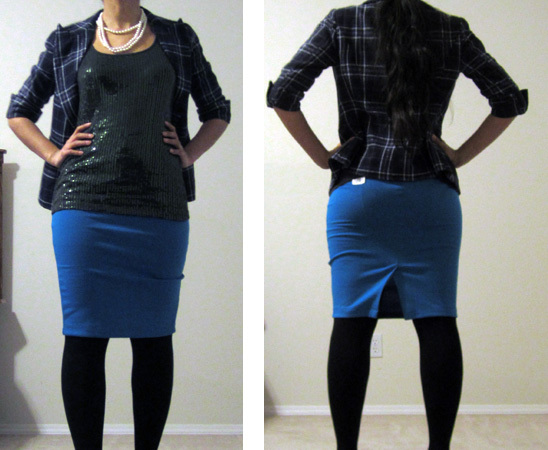 My style, I have recently realized, is kind of girly modern (I think I'm going to call it grown-up gamine!) and I think the studs would work well to inject a bit of tough-girl attitude into my looks. And finally, the namesake of the entire post. So I wasn't quite sure if they'd be hairy or not, and they aren't. The material is a bit glossy and looks kind of cheap from very close up. However, from farther away, the quality looks fine. They're pretty comfortable for the height and have some padding to help out with that. The platform is huge. I wasn't expecting it to be quite so big from the online product shots. 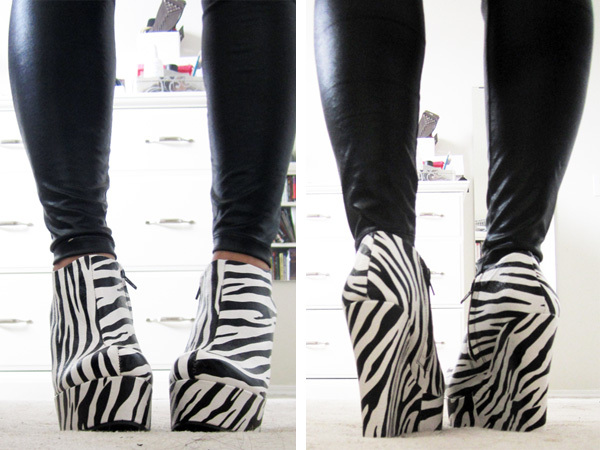 I've tried these on with a few things, and I think I've come to the conclusion that they look like big zebra blocks. I do like the zebra print though. So it turns out that the material ended up being perfect for my proposed solution. What I'm thinking of doing is painting the non-platform part either black or white. I know black would unequivocally look good, while I'm not sure the white would, but I don't have any white shoes and I would like some. Thoughts? Overall, I'm pretty happy with everything and can think of may ways to wear these purchases. Even though there are a few issues, I think they're definitely workable! I apologize for not being able to find product images. Most everything appears to be sold out. Just a note about Forever 21 online shopping-- I've done two orders, one in the US and one in Canada, and both have been excellent. I received what I ordered, in the right sizes and colours, and shipping is quick-- less than a week. The packaging is good, with everything separately packaged in bags. Whatever shall I do with the zebra print booties? That first dress reminds me of a layered cake haha- in the best way possible!